I didn't think it would be so hard to find peeps on Easter. I was wrong. 3rd store I tried finally had a few boxes of purple bunnies, and the 5th store finally had the rest. 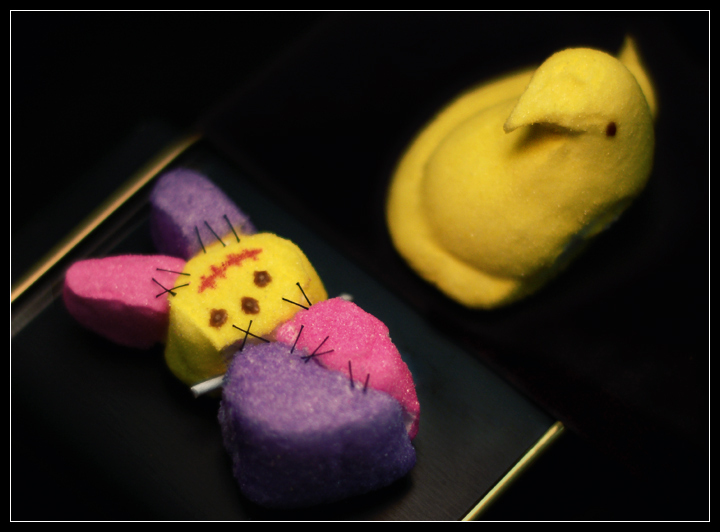 I didn't feel like hunting down blue bunnies to rally make a colorful Frankenpeep. Anyway.. chopped up a bunch of peeps, put the head, body, ears and arms together (ate the leftover parts) and tried sewing the seams. HA! Gave up on that really quickly. Too sticky. Tried microwaving it so the marshmallow would stick better... the ears puffed up and got goopy and the rest kept falling apart. Tried sticking it together with toothpicks, and still fell apart. I smooshed it together the best I could, laid some little pieces of thread on top of the seams and took a few shots (the thread kept falling in the crevices so that didn't last long). Decided to make another Frankenpeep (no arms this time since that's what was falling off mostly) and this is it (then ate the extra pieces). Finally got it all together and took some shots, and decided it needed a scar and some bolts. The bolts are toothpicks and I desaturated them in PP. Crop, resize, levels, soft light, burn, dodge, acidify, hue/sat, contrast, USM (in no particular order). I'm not expecting much with this, but after all the effort, I figure I may as well enter the little guy. Wow... what a week for that update button! Thanks to everyone for all of the comments and votes. I love that even with a 4th place shot, there were still some comments that were constructive, helping me to see where I could have improved. Though, honestly, with this shot I wouldn't have gone through the hassle of setting it all back up again! Those little black pieces of thread were a pain to deal with! Now, I wonder how long it will take me to finally eat all the leftover peeps! Congratulations on the new PB Melanie! It's been great seeing some of the March Macro participants doing so well this month. My wife & I couldn't stop laughing when we saw your shot. The table you used looks the neck from a guitar. Great idea. Congrats on 4th place! This is such a creative photo. that was a close one!!! Congrats Mel on a top five, beating Hassan,(by a nose) and your personal best! Great idea and execution! Nice image, the focus seems a bit soft (imho). This one cracks me up!!! CREATIVE!!!! Should have done a lil something with other peep. What a great idea! Very creative. Would like to see it a tad bit sharper, but it's well done. looks like he has been peep stitched. Very cool idea, lighting could have bee a little more even and the two lines are a distraction but overall one of my favorites on subject alone. haha WOW This is a really original idea! Fantastic job! As a fan of the peep portrait genre, this one made me truly envious. This was genius. great humorous shot. colors are great. Great creativity - an amazing mind! And well executed, to boot! Proudly hosted by Sargasso Networks. Current Server Time: 04/20/2019 12:17:37 AM EDT.